Nutritious, delicious, protein-packed snacks on the line for fans in select states in Oikos#TripleZeroChallenge. Check offer terms to see if you are eligible for a free*5.3 oz. cup (*plus applicable sales tax). 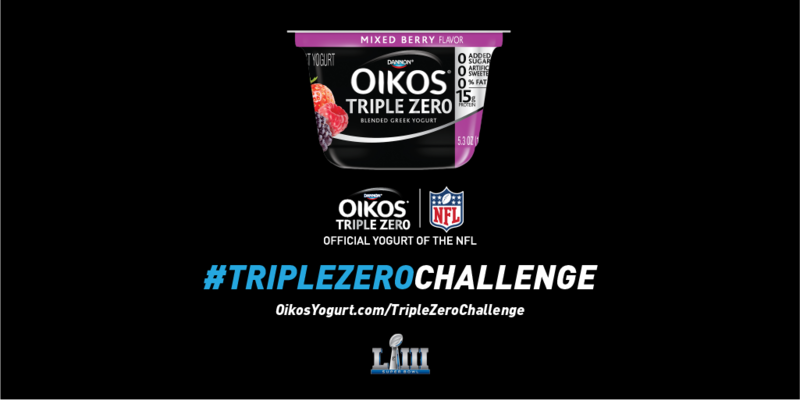 WHITE PLAINS, NY, BROOMFIELD, CO, Jan. 25, 2019 —Oikos, the Official Yogurt of the National Football League, is giving fans even more reason to root for offensive hustle on Super Bowl Sunday with a friendly offer called the #TripleZeroChallenge. If the two Super Bowl teams combine for at least 1,000 yards — that’s one-comma-Triple Zero — Danone North America will offer cups of Oikos Triple Zero Greek Nonfat Yogurt to fans in select states. The promotion follows a 2018 NFL season filled with record-breaking individual and team offensive performances. Fittingly, Super Bowl LIII will feature two of this year’s most productive offenses, putting the 1,000-yard mark, though somewhat rare, well within reach. Last year’s Super Bowl not only marked the first time in NFL history the two teams combined for more than 1,000 yards, it also set the all-time single-game record for total offensive yards with 1,151, called by some the greatest game in history. During the 2018 regular season, teams combined for 1,000 yards or more in three of 256 regular season games. If the #TripleZeroChallenge is met, fans can visit OikosYogurt.com/TripleZeroChallenge from February 25th until March 4th, 2019 and if eligible, download a printable coupon good for one 5.3 oz. cup of Oikos Triple Zero Greek nonfat yogurt which may be redeemed at participating retailers on Monday, March 4, 2019. Exclusions apply; fans should check the offer terms to see if the offer is valid in their state. Limit one offer per person. No purchase is necessary. Due to state laws, the offer is not available to residents of CA, LA, MN, NJ, NV, ND, TN, PA, and MO. Oikos Triple Zero is available in 13 delicious protein-packed flavors – Apple Cinnamon, Banana Crème, Cherry, Chocolate, Coconut Crème, Coffee, Orange Crème, Mixed Berry, Peach, Peanut Butter Banana, Salted Caramel, Strawberry and Vanilla. Visit OikosYogurt.com for more information about all of Oikos’ products and connect with us on Facebook.com/Oikos, Instagram.com/Oikos and Twitter.com/Oikos. Oikos was the first better-for-you food to ever advertise during the Super Bowl, first in 2012 and then again in 2014. Danone North America is a Certified B Corporation business unit of Danone and operates in the U.S. from headquarter offices in White Plains, NY and Broomfield, CO. Danone North America was formed as a Public Benefit Corporation in 2017 to nourish people, communities and the world through its diverse portfolio of healthful dairy- and plant-based products, coffee creamers and beverages. Its portfolio of brands includes: Activia®, DanActive®, Danimals®, Dannon®, Danonino®, Danone®, Earthbound Farm®, Horizon Organic® premium dairy products, International Delight® coffee creamers and iced coffee, Light & Fit®, Oikos® Greek yogurt, Silk® plant-based foods and beverages, So Delicious® Dairy Free, Vega® and Wallaby® Organic. The mission of the Company is to bring health through food to as many people as possible. For more information, please visit DanoneNorthAmerica.com. *Not a low-calorie food. See Nutrition information for calorie content.